This week we catch up with on of Virgin EMI's latest signings, Adam French, during the ‘Hit the North’ festival for what proved to be a brilliant and wide-ranging discussion. 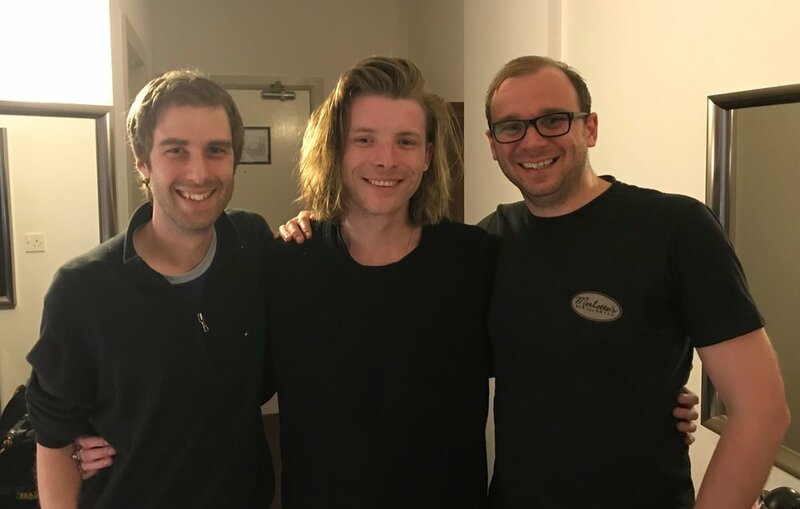 Here we are with Adam, wishing we could still grow (Ben) and get away with (me) that much hair. On the menu was his transitioning from band to solo artist, which involved a fair departure for the type of music he had grown up playing. Another part of the learning curve for Adam was the more unscrupulous side of the music business. We discuss some of the scams like pay to play and his bad experience of early management which ultimately turned out beneficial. Progressing onto the early days of his deal with a major record deal, we loved the way Adam described 'getting signed', which was that it is mainly "a job interview that has gone well". The hard work now begins and it was interesting to here him outline how nothing is gauranteed and to be taken for granted. Moving on to Adam's trip to Africa, it got us thinking about the potential opportunities that exist for upcoming artists. It was something specific to him that created the opportunity, however playing two weeks worth of gigs in Botswana was well worth it and an amazing experience. The good cause this week is Surfers Against Sewage. There is too much plastic and general waste in our oceans. This crew are making a difference and we applaude them. Adam's Website - For live dates, store, videos and more, check out his website here. Surfers Against Sewage - The charities website can be found here.